Having fresh water to drink is taken for granted nowadays – at least by the majority of the world’s population. Throughout the history of mankind, people have taken many different measures in their pursuit of clean, safe water. The Romans, in particular, paid great attention to aqueducts and treated these works of engineering with respect. After all, the water systems were a major factor that allowed Roman cities to flourish and attract people from far and wide. Once a town reached a certain size, temples, basilicas, and palaces were erected. One such Roman basilica was erected on the first of the seven hills of Constantinople sometime during the 3rd century. Like all Roman structures, this basilica too was very grandiose. With lavish gardens and in its position facing the Greek Orthodox cathedral Hagia Sophia, it was a sight to behold. Time did its best to break it down, but its story has been preserved due to a different kind of basilica found deep beneath the busy city. 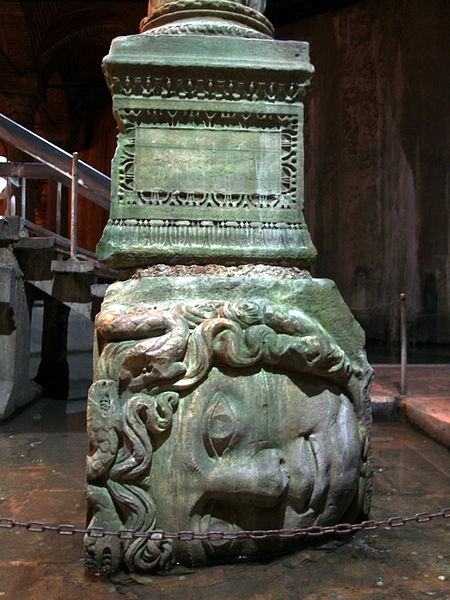 One of the Medusa head pillars. Much like today, Constantinople was a busy town filled with artists, merchants, and people who traveled great distances to be part of this cultural center. 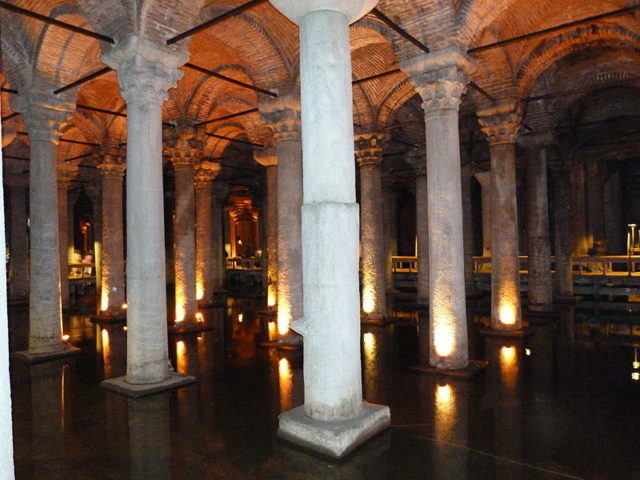 Hidden deep beneath the streets was a number of cisterns that powered this great metropolis. One stood out from the rest. 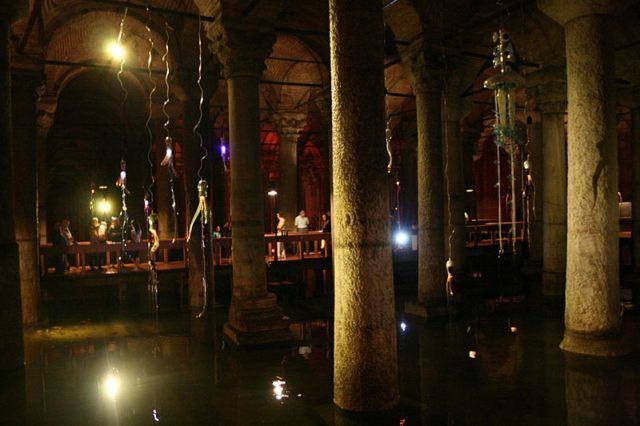 500 feet from Hagia Sophia, deep underground, a cistern spread across 3,300 square feet of land and had a capacity of 21 million gallons of water. Justinian I ordered this cistern to be built in 532 AD. 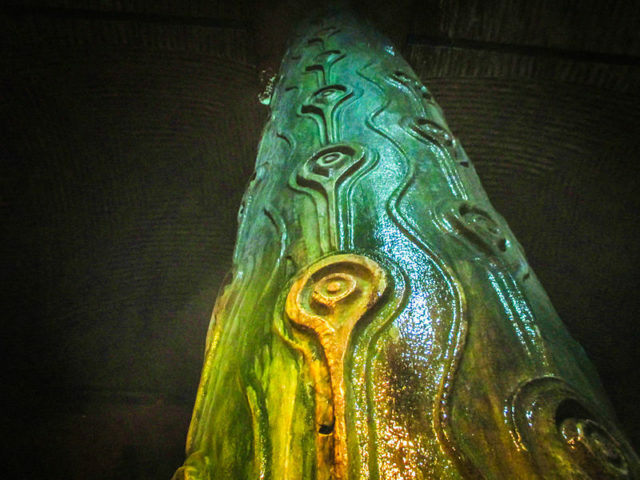 Given the fact that it was deep underground, hundreds upon hundreds of columns were erected to support the busy streets of Constantinople and prevent them from caving in. Even though the columns were far from the public eye and would never see the light of day, their design was worthy of a royal palace. The columns were created from the remains of other buildings and towered 30 feet in height. They were carved with the utmost attention to detail. Some hold carvings of the mythological Medusa, the mother of the winged horse Pegasus and the warrior Chrysaor. According to mythology, Medusa had a deadly gaze and turned everyone who dared to look her in the eyes to stone. According to legend, to counter this effect the builders turned Medusa’s head sideways and even upside down. To modern architects, this was a smart move and logically had nothing to do with mythology but everything to do with weight distribution and stability, as turning the head upside down offered more support. 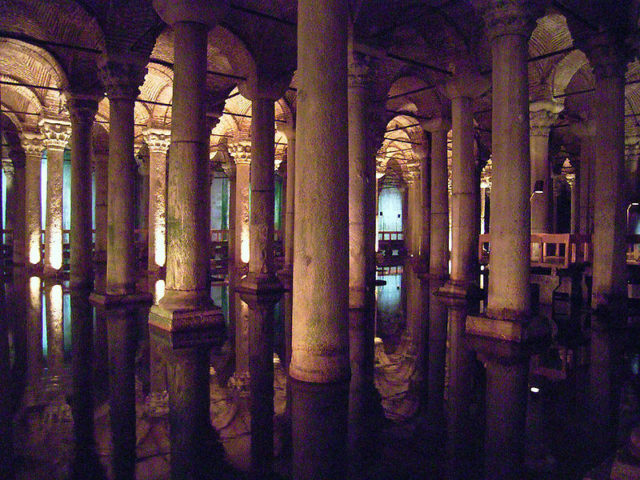 The cistern provided fresh water to the citizens of Constantinople. 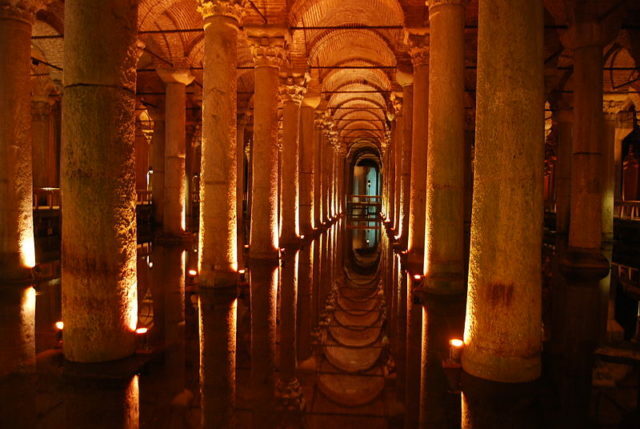 But once the Ottoman Empire came to power and conquered the city in 1453, “The Sunken Palace” – as the cistern was and is often called – was closed. 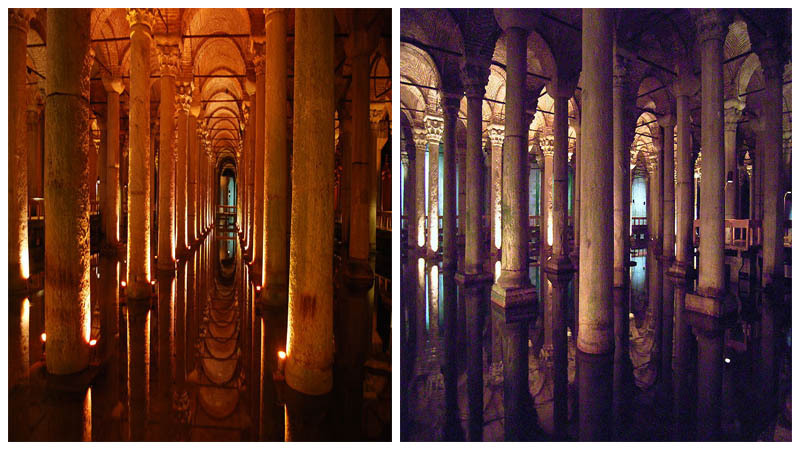 The story of the Basilica Cistern got lost in the cracks of time until it was completely forgotten. 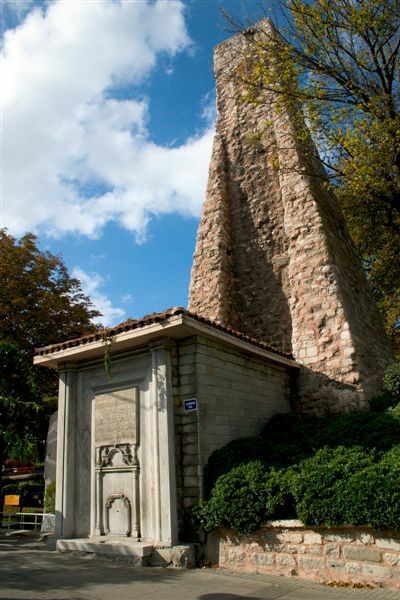 Apart from the occasional use by the Ottomans – who called it “Yerebatan Saray” – to hide a dead body, the cistern stood in silence until a man that had nothing to do with Constantinople discovered it in 1545. Sent by Francis I of France, Petrus Gyllius came to the city in search of ancient manuscripts. Led by tales of old and stories of people fishing in their basements, Petrus went investigating what was beneath the city. 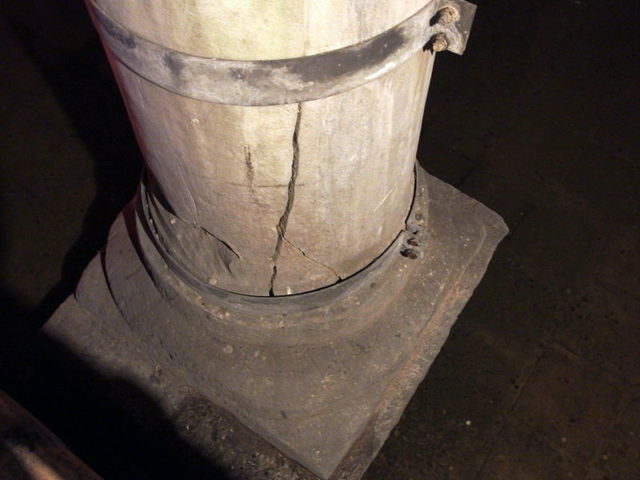 Since its rediscovery, the cistern has been renovated three times and has managed to survive to modern times. Today, it is a famous tourist attraction and hosts concerts and events all year around. It is also a famous filming location and has been used in major blockbusters such as Inferno starring Tom Hanks, The International starring Naomi Watts, and in the James Bond film From Russia with Love.